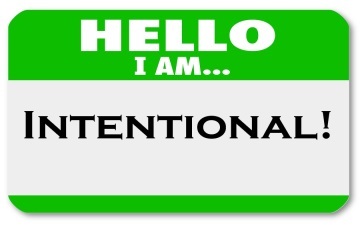 Intentionality means doing things with purpose and passion. Being aware and conscious about your current state and facing that hard reality that changes need to be undertaken in order for you to attain your dream. According to Lao Tzu, resisting reality will create sorrow that can only hold you back. Why choose that path when you have the option of turning things around? In my opinion, it is never too late—never unless you’re dead, that is only the time it is final. Till that happens, you have the opportunity to seek the changes you want to better yourself. This step starts with a personal assessment which focuses on identifying your strengths and weaknesses. The purpose of identifying your strengths is to come up with plans to continue to find ways to highlights your strengths. The weaknesses identification is critical to your growth and development, because more often than not, some of your weaknesses are single handedly holding you back or pulling you down. Facing the hard reality is not easy. Who wants to sit there to pinpoint what is holding them back? However, it is a crucial step in your growth and development to face the hard reality head on. As Colin Powell says, a dream doesn’t become reality without hard work. The hard work here is to painstakingly list every weakness and be intentional about how it is holding you back. Without fully disclosing and articulating these, it is hard to find the way forward. Once you’ve listed each of the weakness, prepare a plan on how to address that challenge. What can you do to address it? Do you need training? Do you need a mentor? Do you need a coach? What is that one thing that can help you turn the corner? During this step be intentional and spend the right amount of time and create a plan. Do the same for your strengths and determine how you can continue to highlight it. What are the opportunities to showcase your strengths? I often ask people this question, “Would you ever consider driving without a direction? How would you know if you arrive?” If you won’t drive without a direction, why are you willing to drive your life without direction? Don’t take chances with your career, plan, act, do, reassess and continue that cycle. To close, on my next blog I’ll focus on making it happen. Let me know what you think of my blog. If you like it, share it someone you know who will benefit from reading it.